Single phase supply of 220 Volts/50 Hz is available in almost all remote areas but when it comes to availability of 3-phase supply the connections have to be taken from supply board by giving extra charges even when any single equipment has to be operated. In rural or agricultural areas and remote villages where irrigation pumps are needed for fetching water, single phase motor pumps are used as only single phase supply is available in these areas. Using 3-phase motor in these pumps will be advantageous in this scenario. So to mitigate this problem "single phase to three phase converter" project is constructed. 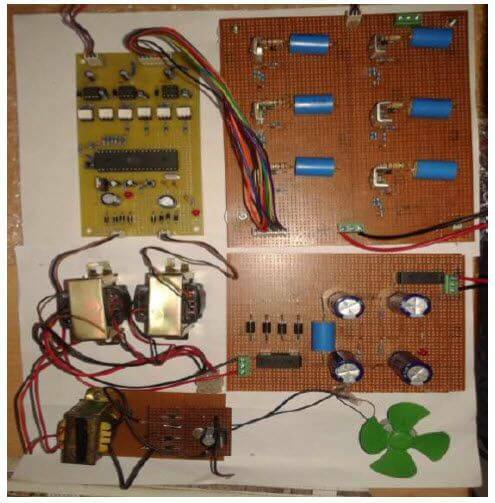 This project is good for electrical engineering students. You can also subscribe to FINAL YEAR PROJECT'S by Email for more such projects and seminar. "Three phase Induction Motor" is used when high torque is required. It is used because of its simplicity, reliability and low cost. So in places where single phase supply is available but 3-phase supply is not reachable, then a converter can be used to convert incoming single phase supply to three phase supply for operating 3-phase equipment such as 3-phase induction motor used in various applications such as Low-Power industrial Applications, Rural/Agricultural Applications and for driving 3-phase Induction Motor in Laboratories. 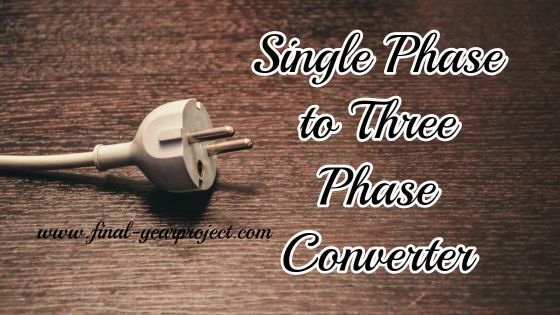 So, by using Single phase to 3-phase converter none of the external incoming 3-phase supply will be needed. Using this converter will save infrastructure charges for establishing 3-phase supply and charges of supply board. * Low overall cost of setup. * Moderate motor performance during startup. * High steady-state performance at line frequency. The converter will convert the single phase supply to 3-phase supply using power electronics. The project comprises of a 3-phase Inverter which will take DC power input generated by a rectifier. The DC power will be converted to 3-phase power by the operation of inverter using MOSFET ( Metal Oxide Semiconductor Field Effect Transistor). The single phase supply will be converted to DC supply using Rectifier and then that DC supply will be converted to 3-phase supply using PWM (Pulse Width Modulation) technique. The Power MOSFETs will be operated such that they operate in different cycle hence generating three different voltages as output with a phase difference of 120 degree each. The MOSFETs will be given gate pulses through MOSFET drivers and those gate pulses will be generated by a Microcontroller using PWM technique. 3 PWM pulses will be generated by the microcontroller for controlling the output through the MOSFETs. The output will be R, Y and B voltage legs which can be connected to 3-phase loads such as 3-phase Induction Motor or 3-phase load made by bulbs. Each leg will generate 220V/50 Hz and output will be 440 Volts. This project report on "single phase to three phase converter" contains the block diagram, hardware requirements, explanation of the components, circuit diagram, working of the project, etc. Use this project report for your reference and study purpose only.